Sixty patients with ALS and 45 age-matched controls gave informed consent to participate in a prospective neuroimaging study in the Pitié-Salpêtrière Hospital in Paris. Participating patients had probable or definite ALS according to the revised El-Escorial criteria. Patients with cognitive impairment, relevant comorbidities and taking medications other than riluzole were excluded from the study. Cervical cord data were acquired from C2 to C7 on a 3T MRI system (Siemens TIM Trio). A T2-weighted three-dimensional turbo spin echo protocol was used for structural imaging with an isotropic voxel size 0.9×0.9×0.9 mm3, field of view (FOV)=280×280 mm2, 52 sagittal slices, repetition time (TR)=1500 ms, echo time (TE)=120 ms and acceleration factor=3. DTI data were acquired using a single-shot echo-planar imaging sequence. The acquisition was cardiac gated with a voxel size=1×1×5 mm3, FOV=128×128 mm2, TR=700 ms, TE=96 ms, acceleration factor=2, b value=1000 s/mm2, 64 diffusion encoding directions and four averages. 3D gradient echo images were used for magnetisation transfer (MT) imaging with slab-selective excitation, Gaussian envelope, 9984 μs duration, frequency offset of 1200 Hz, voxel size=0.9×0.9×2 mm3, FOV=230×230 mm2, axial orientation with 52 slices, flip angle=23°, TR=28 ms and TE=3.2 ms. MT ratio (MTR) was computed voxel-wise using the MTR=100×(S0−SMT)/S0, equation, where S0 and SMT represent the signal without and with the MT pulse, respectively. Linear Image Registration Tool of the FMRIB FSL software (FMRIB’s FSL-FLIRT) was used for DTI motion corrections with three df. Four diffusion metrics were subsequently estimated using FMRIB-FSL software’s diffusion tensor model tool (FSL-DTIFI), fractional anisotropy (FA), radial diffusivity (RD), axial diffusivity (AD) and mean diffusivity (MD). Descriptive statistics were used to characterise SC profile. Group comparisons were performed using the t-test or the two-tailed unpaired Mann-Whitney U test with significance set at P<0.05. A RF classification model was utilised to distinguish patients with ALS from controls; 1000 trees were built, and 1000 bootstrap resamplings were performed at each step. Candidate predictor variables included the four DTI parameters, MTR and CSA at C2–C7 spinal levels. Left-one-out observations were used to test classification accuracy of each tree. Goodness-of-fit of the RF was assessed averaging the individual tree classification errors. K-fold cross-validation was computed using a ‘k’ value of 50. Input variables were ranked based on their classification power. In order to establish the prediction hierarchy of variables, the normalised variable importance (NVI) was calculated for each covariate based on the increase of classification error when their values in a node were permuted randomly. To estimate both the overall diagnostic performance of the algorithm and individual variables, receiver operating characteristic (ROC) curves were plotted and areas under the ROC curve (AUC) were calculated. Confusion matrices were generated to evaluate sensitivity and specificity profile of the classifier. The optimal cut-off value was calculated using Youden’s index (sensitivity+specificity−1). The clinical and demographic profile of the cohorts, MRI characteristics and RF classification outcomes are summarised in figure 1. (A) Patient demographic, clinical and radiological profile is presented with mean values, SD and P values for comparisons between patients with ALS and healthy controls. (B) Random forest classification. The hierarchy of normalised variable importance values of variables in distinguishing patients with ALS from healthy controls. AD, axial diffusivity; ALS, amyotrophic lateral sclerosis; CSA, cross-sectional area; FA, fractional anisotropy; MD, mean diffusivity; MTR, magnetisation transfer ratio; RD, radial diffusivity. The algorithm led to excellent diagnostic performance (AUC 0.96), distinguishing patients with ALS from controls with a sensitivity of 88% and specificity of 85%. The highest discrimination ability was achieved by RD (NVI=0.19), followed by FA (NVI=0.18), and CSA at the C5 spinal level (NVI=0.14). When evaluating these three parameters singularly, RD has reached a sensitivity of 90% and specificity of 76% (AUC 0.91). Using FA alone, sensitivity was 82% and specificity was 72% (AUC 0.85) and relying on CSA values at C5 spinal level alone, an 80% sensitivity and 72% specificity were reached (AUC 0.86). Despite relentless efforts in biomarker development, the diagnosis of ALS remains primarily clinical and a long diagnostic delay continues to hamper timely recruitment into clinical trials. While diagnostic classification methods based on brain imaging metrics have been previously proposed in ALS.1 2 SC imaging parameters have not been tested in computerised diagnostic applications to date. 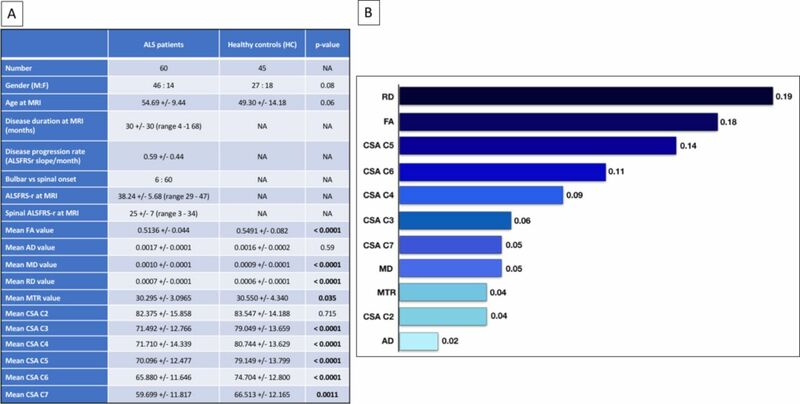 Our findings suggest that classification models of multimodal SC imaging data successfully differentiate between patients with ALS and HC with relatively high sensitivity and specificity and that combining complementary SC indices leads to higher diagnostic accuracy (AUC 0.96) than DTI or morphometric parameters alone. The unparalleled advantage of cord imaging in diagnostic applications stems from its ability to evaluate both UMN and LMN degeneration, likely to be reflected in the observed DTI and CSA alterations, respectively. This proof-of-concept study demonstrates the clinical potential of SC imaging in diagnostic applications and more broadly, as a promising candidate biomarker of ALS. Our main study limitation is the reliance on patients with ALS and HC alone. Follow-up studies are needed to include patients with ALS mimic syndromes to optimise and validate spinal imaging-based classification. Ultimately, the combination of SC and cerebral MRI metrics and recruitment of larger patient and mimic cohorts will be required to appraise the true diagnostic potential of quantitative imaging across the entire ALS spectrum. First and foremost, we are indebted for the generosity and kindness of our patients and healthy controls for participating in this research project. We also thank the neurologists of the Paris ALS center who participated in the recruitment of the patients: Drs Nadine Le Forestier, Vincent Meininger, Gaelle Bruneteau, François Salachas, Maria del Mar Amador and Rabab Debs. We thank the neuroimaging platform (CENIR) located in the Brain and Spine Institute (ICM, Pitié-Salpêtrière, Paris, France) especially Eric Bardinet and Stéphane Lehéricy. We finally thank Sophie Blancho (IRME) for the management and coordination of this study and the ARSLA association for their continued support for ALS research. Contributors GQ had full access to all the data in the study and takes responsibility for the integrity of the data and the accuracy of the data analysis. M-MEM, GQ and SD actively participated in the design of the study, in the preparation of MRI protocol and in the establishment of MRI acquisition settings. TL and P-FP selected patients with ALS to include in the study and performed clinical and diagnostic evaluation. MRI acquisition, imaging data treatment and analysis were performed by GQ, M-MEM and SD. Statistical analysis was performed by GQ. Critical revision of the manuscript for important intellectual content was done by GQ, P-FP and PB. P-FP and VM-P obtained funding for the study. P-FP, VM-P, SD and M-MEM were responsible for the administrative, technical or material support. P-FP did the supervision. Funding This study was supported by the Association Française contre les Myopathies-Téléthon (AFM-Téléthon) and the Institut pour la Recherche sur la Moelle épinière et l’Encéphale (IRME). The research leading to these results has also received funding from the program ‘ Investissements d’Avenir’ ANR-10-IAIHU-06. PB is supported by the Health Research Board Ireland (HRB EIA-2017-019), the Irish Institute of Clinical Neuroscience IICN— Novartis Ireland Research Grant (IICN 2016), and the Iris O’Brien Foundation. GQ is supported by a PhD grant by the University of Padova (Italy). Ethics approval Ethics Committee of Pitié-Salpetrière Hospital, Paris, France.